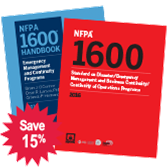 Help ensure your community or organization is prepared for any type of crisis or disaster -- resulting from natural, human, or technological events -- with the NFPA 1600® and Handbook Set. Apply the latest strategies for disaster prevention, mitigation, preparedness, response, continuity, and recovery. This new Set from NFPA® includes NFPA 1600: Standard on Disaster/Emergency Management and Business Continuity/Continuity of Operations Programs -- the Standard used for the development, implementation, assessment, and maintenance of disaster/emergency management and continuity of operations programs -- along with the NFPA 1600 Handbook filled with a wealth of support for program development and implementation. Anyone responsible for disaster prevention, mitigation, preparedness, response, continuity, and recovery needs this Set. Order for special savings. NFPA 1600 was adopted by the U.S. Department of Homeland Security as a voluntary consensus standard for emergency preparedness, and the National Commission on Terrorist Attacks Upon the United States (the 9/11 Commission) recognized NFPA 1600 as our National Preparedness Standard. The 2013, 2007 and 2010 editions of NFPA 1600 have been designated by the U.S. Department of Homeland Security, to be used by accredited 3rd parties, to evaluate and certify compliance of entities under its Private Sector Preparedness (PS Prep) Program.